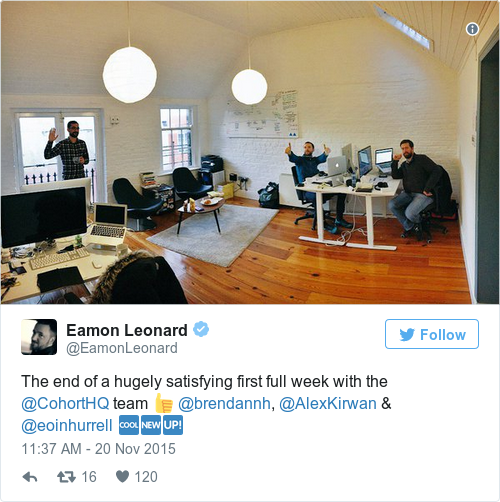 Eamon Leonard’s team have been quietly building Cohort – with designs on taking down LinkedIn. BURROWED AWAY IN a Temple Bar loft, one of Ireland’s top angel investors, a data scientist, a designer and an engineer are plotting how to knock LinkedIn off its perch. Leading the operation, known as Cohort, is Irish startup backer Eamon Leonard, who has a proven track record for spotting the next big thing. Besides building his own software company, Orchestra, before selling it in 2011, Leonard has amassed a healthy portfolio of investments. They include, but are by no means limited to, Pat Phelan’s Trustev, which sold for $44 million in December, customer-service platform Intercom, that recently raised $50 million, and Brewbot, a Belfast-based company that makes a beer-brewing robot. While the project was kicked off in November, Cohort remains firmly in development. It is essentially an application that draws on data from email, phone contacts, Twitter, Facebook and other networks to automate the search and discovery of people with the skills you’re chasing. Despite being very much under wraps, Cohort already features an interesting array of ‘advisors’ – some of whom have also invested in the embryonic startup. Irish Intercom CEO and founder Eoghan McCabe, whose San Fransisco-based company does its R&D in Dublin, is on the list, as is US entrepreneur and early Intercom backer Jonathan Siegel. Other notable names include venture capitalist Gil Dibner, who specialises in early stage tech investments, and Harper Reed, the chief technology officer for Barack Obama’s 2012 re-election campaign. One supporter not mentioned on the website, but who Fora understands is included in the advisors’ ranks, is former US Navy Seal commander Curt Cronin, now an entrepreneur and leadership coach, who was in Dublin earlier this year to meet with Leonard. 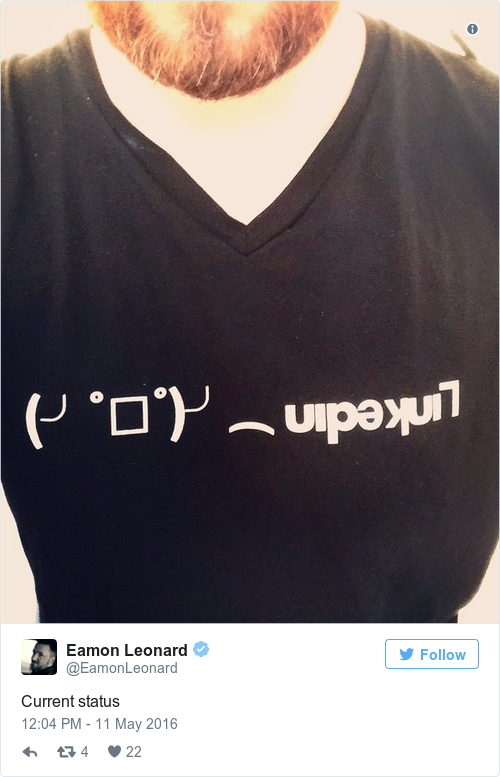 Over the past few months, Leonard has let information about the project trickle out in a very cryptic fashion at several events and on Twitter. Last week, Cohort revamped its website and is taking requests for early access to the service. Earlier this week, Fora received a private demo of the product, which is currently at an invite-only stage. The team is, for now, remaining tight-lipped about when it will be available more widely and they are not revealing how Leonard plans to make money from the business. Unlike other social networking apps, Cohort doesn’t require users to create profiles, it simply draws on information from social networking apps and other sources of contacts to help users get the most value out of their networks. To use an example, if you were looking to hire a web designer or get suggestions about who may be a good fit as a marketing manager, previously you would have to email, message or phone people to see if they could recommend a good person for the job. Using Cohort, users can simply type into to the app, “I’m looking for someone with marketing experience” or “I need someone to design a website”. It will then give you a list of people in your network who might be able to recommend someone for the role you need to fill. This update will also be posted in the feed of those within your network who also use Cohort and they can also pitch in to help recommend people who might be a good fit for the role. 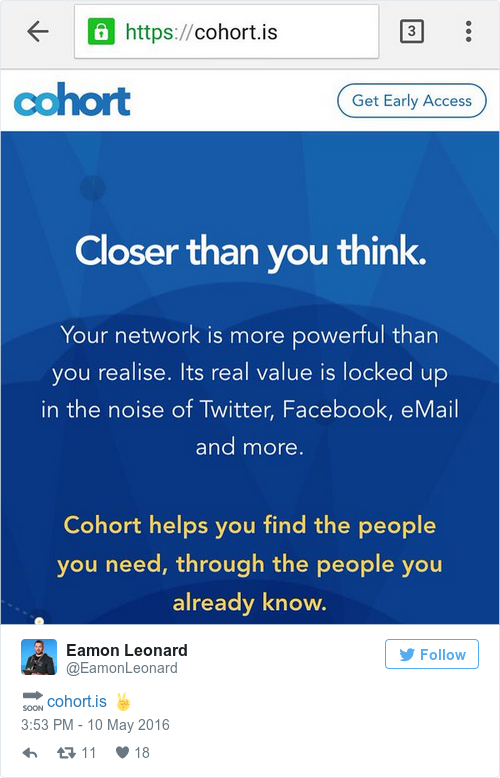 Cohort essentially aims to cut out the effort it takes to see who in your network of contacts can help you find what you’re looking for. Does it have the capability to beat LinkedIn? Well, it definitely looks like a more streamlined version of parts of what the world’s biggest professional networking site sets itself up to do – that is, help people tap their business contacts. Over the years it has become harder to get value from LinkedIn because the social network doesn’t really aid you in distinguishing between those who are valuable connections and people who are just adding you so they can claim extra clout. Although Cohort could have a big effect on how businesses look for talent, it’s important not to pigeonhole the app as just another solution for recruitment. The app is designed to solve any business problem you can put into words like, “I need advice on a good manufacturer in East Asia” or “I need some tips about setting up a US base of operations”. In a couple of seconds, it will be able to tell you who in your network has experience, or knows someone with expertise, using Asian factories or in the transatlantic market. As business contacts and personal networks increasingly sprawl across multiple platforms, Cohort has the potential to become the single go-to source for enlisting the best staff or overcoming a business hurdle if it fully delivers on its promise.